Councillors rising to protest the mayor’s action at the beginning of this month’s council meeting. The list of efforts to curb Rob Ford is growing again: councillors have now signed a petition to convene a third special meeting (in addition to the two they’ve already called) with the aim of cutting the mayor’s office budget and staff. The goal is to shrink the mayor’s office budget to the size of a councillor’s; this would enable him to retain three or four staff members and have some money for expenses. The remainder of his budget would, if this motion passes, be transferred to Deputy Mayor Norm Kelly’s office. Ford’s staff would be given the option of trying to stay with the mayor or tranferring to the deputy mayor. 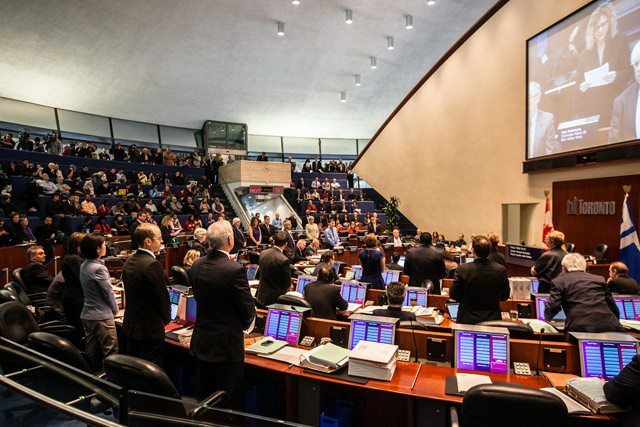 The motion they have presented also would temporarily revise council’s structure so that the mayor, who is automatically the chair of the most powerful of council’s committees—the executive committee—would no longer serve in that role, and would be replaced by the deputy mayor. Yesterday councillors—who can convene a special meeting on 24 hours’ notice if a majority of them sign a petition to do so—filed paperwork for two meetings with the City clerk’s office. Those two meetings (they need two separate ones because special meetings must, according to council procedures, be dedicated to narrowly-defined issues) will look at curbing the mayor’s authority. At the first meeting—which will begin on Friday at 9:30 a.m.—they will debate whether to strip the mayor of his power to appoint and remove the chairs of council’s various committees. (This is significant because chairs are the gatekeepers of their committees’ respective agendas—it’s a way of controlling what does and doesn’t get debated at City Hall.) That motion would reaffirm that the councillors currently chairing committees—all of whom were appointed by Rob Ford—would keep their posts. At the second meeting, which is scheduled to start as soon as the first one ends, councillors will debate whether to strip the mayor of his role in managing emergencies, and transfer that responsibility to the deputy mayor (who, like the committee chairs, was also appointed by the mayor). Because special meetings require 24 hours’ notice, this third meeting can’t be held tomorrow; it will take place on Monday, beginning at 12:30 p.m.
1. City Council delegate to the Deputy Mayor all powers and duties which are not by statute assigned to the Mayor. a. The staff salary and office budget under the control of the Mayor be the same as that of a member of Council. b. The balance of the operating budget be reallocated to the City Clerk’s Office to be administered under the oversight of the Deputy Mayor. a. The Deputy Mayor is the chair of the Executive Committee. b. The Executive Committee elects a vice chair from among its own members. All three of these motions have a built in sunset clause, and if passed would expire at the end of this term of council, on November 30, 2014. All will need a two-thirds majority to pass. Councillors who signed the petitions calling for these meetings were confident today that they have the requisite 30 votes.